Get those rulers ready! 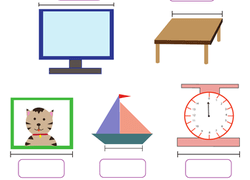 These year three measurement worksheets will give your child essential practise estimating, measuring, and comparing all kinds of objects. Students can use rulers to measure toys and shoes or collect dimensions to build a dollhouse, learn to read thermometers and map scales, discover how cups, pints, and quarts relate, and solve real world measurement problems about community parks. Prepare for an upcoming measurement quiz with this handy review sheet that covers topics from using a ruler to converting quarts to cups. Help Bobby the carpenter make a dollhouse by taking its measurements. How big would it be in real life? Does your child know the difference between centimeters and inches? 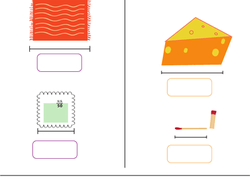 Help him get to know these units of measurement by using a ruler to measure everyday things. Practise estimating and measuring centimeters using your very own paper ruler! Students will measure a drawn pencil and chalk with this fun hands-on activity. Perfect for budding bakers, this worksheet helps kids learn about cups, pints, and quarts. Does your child like helping Dad at his workbench? Let him flex his metric muscles by helping him measure each item in centimeters using the cut-out ruler. Choose a correct scale to use for different types of maps. What is the length of a crayon? A marker? Which one is longer? Students can cut out the included in/cm ruler to estimate, measure, and compare the length of easy-to-find objects in your classroom. Get your students excited about measuring with this fun and colorful hands-on activity! Your students will see the difference between centimeters and inches as they use the included ruler to measure a fidget spinner, toy car, and other fun objects. How many inches from the elephant to the lion? 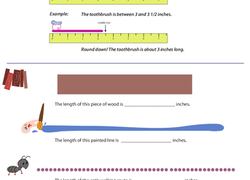 Kids get great practise measuring in inches as they fill out this simple worksheet. Chances are your child knows how to round, but how about rounding in inches? Help him tackle this concept with an exercise in measuring to the nearest inch.